PDF encryption is a powerful and effective way of securing important and personal documents from prying eyes. Once a folder is encrypted, an encryption certificate and a private key are automatically created for the user and any file added to it will be automatically encrypted. In most cases, the encrypted password is difficult to memorize and the user is forced to note the password somewhere. Such manual backups are sometimes unreliable as they can get lost or become tampered with and you lose the password. The user’s private key can also get lost by reinstalling the PC’s software or by creating a new user and deleting the existing one in your computer. In such occasions where bad memory prevails and compromises your access to some important PDF documents, the only reliable solution is to use a third-party application to decrypt the file. There are a number of these Apps on the market, however, not all of them will suit your needs. PDF PASSWORD RECOVER is an interesting option you can use to decrypt your pdf files. The software has been designed specifically for the job and offers a simple and user-friendly decryption procedure that will get the work done in the shortest time possible. This software uses one of the most effective password recovery techniques- the brute force algorithm and exhaustive search. 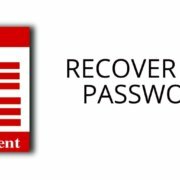 PDF Password-Recover comes with advanced settings that will not only help you extract the passwords but also remove the password-protection feature if you want to. Given the simplicity of the decryption procedure, even first time users will have an easy time navigating through the software. Before using the software application, you need to download and install it on your computer. The installation process doesn’t take long and it requires the .NET Framework to call it a success. .NET Framework is a software framework developed by Microsoft that runs exclusively on Microsoft Windows. In layman language, the .NET Framework is a programming infrastructure that allows the software to install and run successfully on your Windows PC. Once the software has been installed, it launches in a new window and you’ll see all the configuration settings and even take a quick tour before starting the work. To import an encrypted PDF document, click “ADD Pdf File” located at the bottom left of the page. Select the recovery options and choose to set the parameters of the charset-options. Click on start to begin the password decryption process. Why choose to customize settings? Since only one PDF file can be worked on at a time, it’s important to guide the software by specifying some of the things such as the probable password length (if you have a hint) as this will speed up the Password recovery procedure. As far as the password characters are concern, you can customize the charset feature by excluding some of the characters you know weren’t part of the password. Such characters could include; Upper & lower case letters, symbols, numbers, and even spaces. Any details that you remember about the password helps to speed up the brute force process. This customize-setting feature, should, however, be used with precision to avoid misleading the software and hence getting a wrong password combination. Once the brute force process is complete and you’ve obtained the password, use the utility feature to remove the password PDF file to a format that can be copied or edited. When it comes to the pricing features; this software is available in two packages- a free version and a pro version. The later has a higher capability of cracking user-password with complex algorithms and character combinations. It’s also faster with a boosted accuracy and precision level. The free version, on the other hand, can be downloaded and installed for free. It recovers open-passwords with few and simple characters. The Pro version costs $19.90 and comes with a 30-day money back guarantee to make sure you’re getting what you really paid for. PDF Password Recover software uses character combination wrapped in an intuitive interface and offers a reliable and effective solution for decrypting PDF documents. This software has passed the test of time with a good reputation in the market. 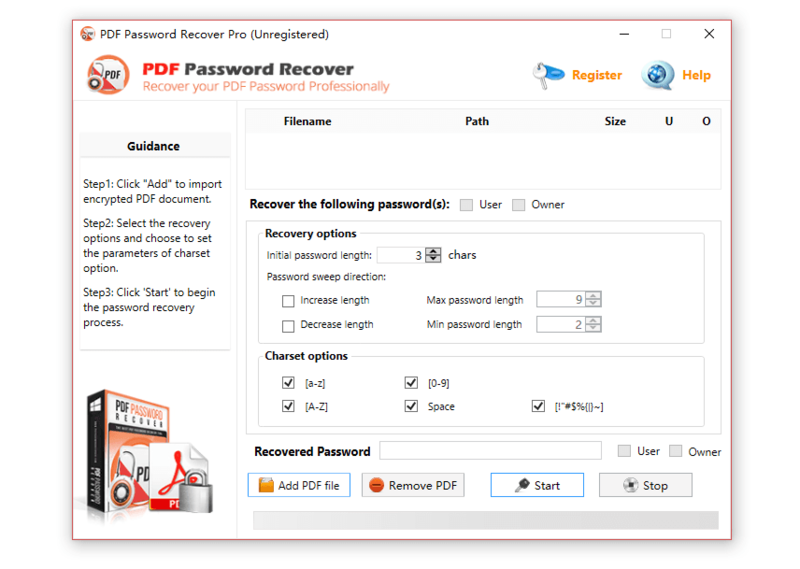 If you’re looking for a third-party Software that will serve your PDF Password decryption needs without breaking the banks, then PDF Password-Recover has got you covered. Why PDF Password Recovery Is The Best Choice?